Have you ever encountered a website or webpage that was frustratingly slow to load? You probably waited while a couple of seconds passed, then a couple more seconds, and then maybe you gave up and went to a different site with your question or need. The last thing you want is for your users, readers, or customers to abandon your WordPress site because of slow load times. Did you know that 40% of people will leave a website if it takes over 3 seconds to load? Or that even increasing speed 850 milliseconds can increase conversions 7% and page sessions 10%? If you need case studies to further convince you, please check out this excellent roundup in Google’s Web Fundamentals. 1. Correctly identify your page speed. You can’t accurately determine your page speed with a stopwatch, or by eyeballing it. 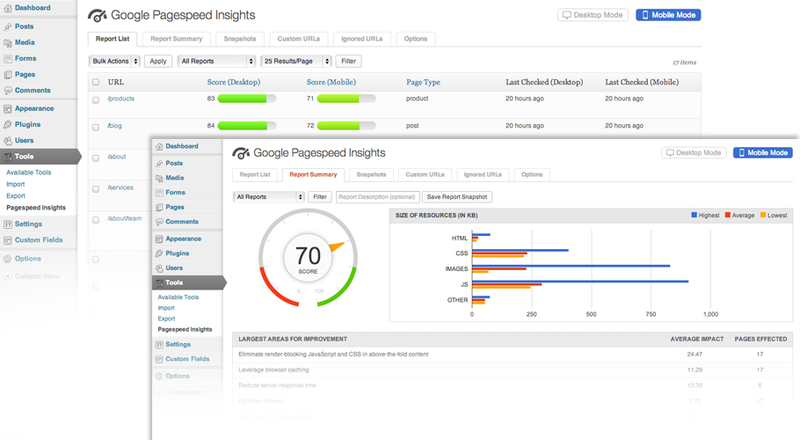 Instead, use helpful tools like Google Pagespeed Insights. Google Pagespeed Insights (GPI) offers detailed page reporting, as well as overall report summaries designed to give you the big picture. You’ll see results as clear, accurate visuals, so you can easily note places where you’re doing well and areas where you need to make a change. With GPI, you can also compare and contrast your desktop page speeds versus your mobile page speeds. GPI will even give you practical suggestions for boosting performance, speed, and user experience. If you’d like to expand your arsenal of page speed testing tools, try out Pingdom or WebPageTest for free. GTmetrix reveals your entire load speed history, along with video playback that reveals exactly where slowdowns are happening. 2. Choose a streamlined, lightweight theme. Exodus, Schema, and Socially Viral all load in less than a second in default mode; but they are less feature-rich and versatile, catering to a specific niche in the market. Always On SSL effectively identifies the website in question as being legitimate and safe. It handles encryption of data between each user and the site, so that no one can “listen in” and perceive, alter, or appropriate any of that information. While this is a good thing for SEO and security purposes, WordPress users often fear that Always On SSL will slow their load times. The delay is usually slight, and with so many cybersecurity threats, it’s worthwhile to employ SSL/TLS anyway. It’s worth noting that the encryption actually doesn’t take up much time at all; the time cost relates to the authentication “handshake,” which requires a couple of roundtrips for the data packets. There are a number of ways you can reduce the impact of Always On SSL. HTTP/2: Work with the HTTP/2 protocol, which is faster than HTTPS and allows for concurrent requests. It also provides HPACK compression, superior multiplexing, and parallelism — all of which combines to make the process swifter and more secure. Other compression options: Try a compression plugin like Gzip or an open-source version like Brotli to reduce the size of data packets and make everything just a little bit faster. OCSP stapling: According to WP Rocket, “OCSP stapling is a method for quickly determining whether or not an SSL certificate is valid. It allows a server to provide information on the validity of its own certificates rather than having to request the information from the certificate’s vendor.” Basically, it eliminates an extra request, saving a bit of extra load time. You can find out how to do it on your server at DigitCert.com. A content delivery network (CDN): WP Rocket explains, “A CDN is a network of servers strategically placed across the globe with the purpose of delivering static content to users much much faster.” You can’t really make the data go any faster, but by using a CDN you can shorten the distance it has to travel. It’s like a shortcut that lessens the time cost of the SSL/TLS handshakes. 4. Install an efficient caching plugin. Imagine that a user visits your site for the first time. Their computer has to load all the PHP scripts from WordPress so the user can perceive your site correctly and interact with it. A caching plugin saves your site’s images, files, pages, and other objects to the user’s computer, storing them on that person’s hard drive. The next time they visit your site, most of the files are already present. Since the entire site doesn’t need to be reloaded, the overall load time is faster. Find a plugin that will handle caching tasks nimbly and effectively. The two I recommend are WP Rocket and W3 Total Cache. 5. Focus on homepage load speed. Some of your webpages may be heavy on content and images, and there may not be much you can do about that. However, you can at least ensure that your homepage loads quickly since most incoming users will land there at some point. To optimize your homepage for fast loading, try these strategies. Show tempting bits of blog posts instead of entire text blocks. Take sharing widgets off the homepage and only include them on post pages. Remove any plugins or widgets you’re not using. Use an image optimizer to decrease the file sizes of images without losing too much in quality. See point two in this article on how to optimize your images for WordPress. Now get ready to accelerate your website. Paradoxically, creating a fast-loading WordPress site takes time. If you’ve been focusing on fresh content to the detriment of load times, take an active step in working with your web team to speed things up. If attracting first-time users is important to you, optimizing your WordPress site for fast load times should also be a priority. By choosing a streamlined theme, understanding page speed, controlling the impact of “Always On SSL,” using a cache plugin, and focusing on your homepage, you’ll be well on your way to a faster-loading, more customer-friendly site. Select your content plugins carefully so you can make the most of content and SEO without clogging up your site. With these strategies, users may soon be abandoning the slower-loading sites in favor of yours.